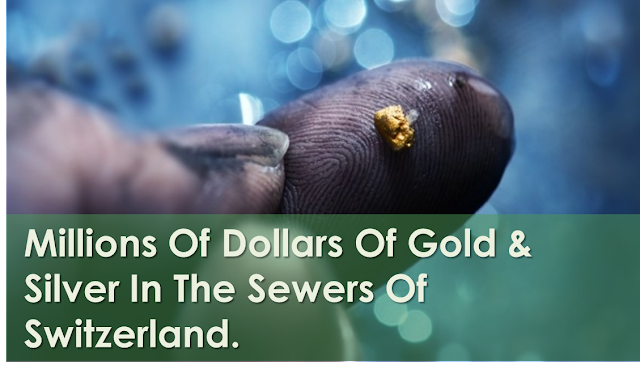 While London's sewers are clogged with lumps of fat and baby diapers, small pieces of silver and gold seem to shine in Switzerland's sewers. Last year, researchers found three tons of silver and 43 kilograms of gold in the wastewater and rubbish in the wastewater treatment stations, which worth three millions Swiss francs (3.1 million dollars). But before people begin searching for jewelery in sewers, a government study has suggested that the source of these expensive nanoparticles is the industry of watches, the pharmaceutical and chemical industries that use precious metals in their products and processes, and Switzerland is known for its watches. "We hear stories about an angry man or a woman throwing jewelery in the toilet, but unfortunately we did not find any rings," said Bass Ferennes, who wrote a report on the subject. "Gold or silver levels in sewage are very small, measured by micrograms or even nanograms, but when accumulated it gives a big quantity". Researchers are now looking at the feasibility of extracting minerals that end up as sediments in the sewers before they are burned as usual, but the cost has not yet proved ecouraging.